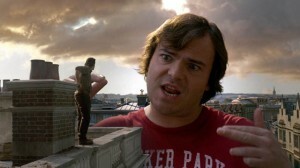 Jack Black makes some noise in Gulliver's Travels. Swept via mystical whirlpool to the land of the Lilliputians, Gulliver—a relative giant among the local population—rises, after numerous trials and “noble” deeds, from gawked-over “beast” to the greatest hero Lilliput has ever seen. In the process, he introduces the charmingly outdated Lilliputians (The Adjustment Bureau‘s Emily Blunt and Forgetting Sarah Marshall‘s Jason Segel, among them) to all the glories of McMansions and contemporary pop culture (which seem dubious gifts at best), while also finally gaining the courage to attain his dream job, his dream girl, and his dream life back home. Somewhere in there is a brief interlude in Brobdingnag, the land of giants, which feels cursory and contrived enough to require no additional explanation here. It would be unfair — and downright mean-spirited — to review a movie like this as if I were, say, a college professor of 18th century literature. The point of this movie, after all, is to serve as the kind of family-friendly fare that parents can bring their children to, confident that a PG good time will be had by all. Fair enough. This movie’s one irredeemable flaw, however, is that it fails to be fun. It tries on the one hand to be a funny, silly, fantasy adventure for children, while also maintaining a semi-cynical, wink-wink tone for adults, in the mold of films such as Shrek. As is so often the case with movies that try too hard to be both, it ultimately succeeds at being neither. The visuals, however, are gorgeous, and the cast and crew have done a truly outstanding job of making us believe that all scenes were shot with all actors on one set, rather than green-screening Black and adding him later to the Lilliput scenes, which is actually the case. The seamless fashion in which this effect is pulled off deserves plenty of praise. The special features on the DVD are the standard fare: interviews with the cast and crew, behind-the-scenes looks at how Jack Black was digitally integrated with the Lilliputians, et cetera. There’s also a faux TV show called “I Don’t Know,” in which Black — in character as Gulliver — attempts to explain the mysteries of the Bermuda Triangle.